Thanks for stopping by the GoldHat Music website. You can watch our free guitar lessons and music videos, and listen to some great music created by our GoldHat Artists and friends of GoldHat Music. We have a popular GoldHat Music Channel on YouTube. Our YouTube channel features over 200 free guitar lessons and music videos by Mark Easley and friends of GoldHat Music. Now that's a lot of guitar strummin'! The free guitar lessons on our website and YouTube channel are completely user supported by the donations made by our students, subscribers, and friends. Thanks for your support. Our suggested donation is $5, but you can donate any amount you wish to support GoldHat guitar lessons. We also have fun doing collabs with fellow YouTubers like this one, which was made with our YouTube friend deanb92 in Maine. goldhat3 and deanb92 play "Sundown"
Get it now! 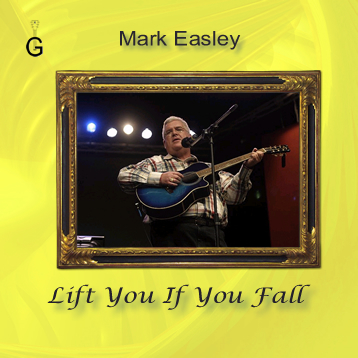 The all original CD "Lift You If You Fall" from Mark Easley has a mix of folk-rock songs, country tunes, and ballads. Mark writes, sings and plays both upbeat and moving songs influenced by the most popular songwriters of the 60s and 70s. Click here to learn more and to listen to a couple of the songs. Digital Distribution. You can purchase and download songs from this CD at Apple iTunes. The Best of Mark Easley CD Available Now! Mark plays "Here Comes The Sun"
GoldHat Music is pleased to offer the "Best of Mark Easley" CD. It has all the favorite songs that were voted for by the fans online. The Acoustic Guitar Beatles CD from peacejoytown! A great GoldHat CD is available called "With A Little Help From My Friends" by the popular Japanese guitarist Hiroshi Masuda, also known as peacejoytown! It features his beautiful solo acoustic guitar arrangements of classic Beatles tunes! You can also order other great Fingerstyle Guitar CDs by peacejoytown. You can get all of Hiroshi's CDs from his Hiroshi Masuda website. If you like praise music, please stop by our CFX Band Music page to hear some live tracks by our CFX Band. I really enjoy playing acoustic guitar in the band every week. You can also view some of our favorite messages and comments from friends of GoldHat Music around the world. Here at the GoldHat site you can also download free mp3 songs and listen to music from Mark and Hiroshi. Mark also has the music posted for his CD Back to the Boxer, and from his Bonus Tracks. Other free downloads feature live shows and interviews with Mark and Hiroshi. Guest Artists: We also have bonus tracks and videos by special guests who have recorded at GoldHat.